This is a guest posting by our Collections Coordinator, Karina Greenwood. 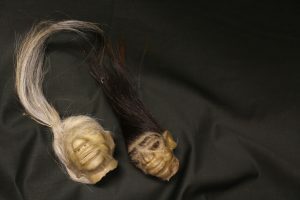 Back in July of last summer, while looking through our database, we were surprised to notice that we had three shrunken heads in the museum collection. This was an alarming surprise, as having human remains in a museum collection is a serious issue, and we had incomplete records about the origins of these heads. 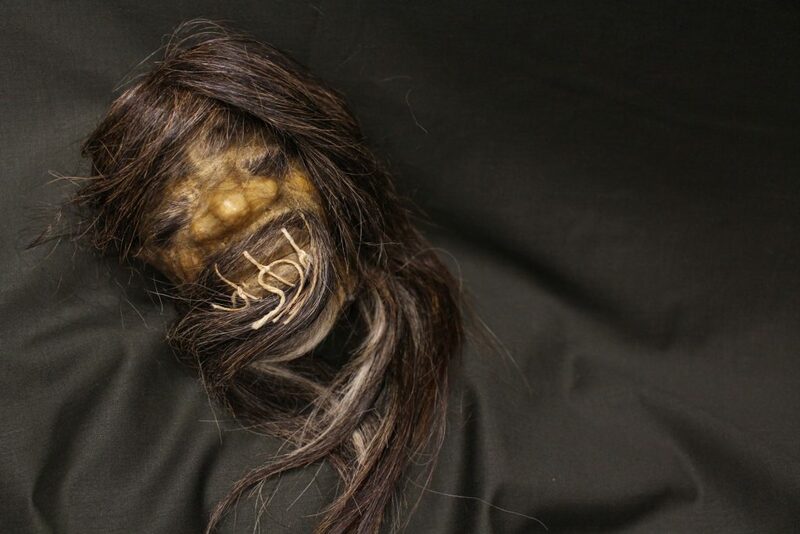 Shrunken heads are severed human heads, with the skull removed and boiled in fat so that the head shrinks a lot in size. This practice was found primarily in South American indigenous communities in Peru and Ecuador. The Jivaro people had a practice of taking the decapitated heads of their enemies as trophies, and would shrink them as they believed this process would prevent the spirit of their victims from enacting revenge. When colonial explorers encountered these communities (beginning in the late 19th century), their fascination for these heads created a market for them, and as a result, many began selling fakes, usually made from goat or monkey skin. There is an ongoing conversation about the ethics of keeping human remains in museums collections, and how to handle them with respect, especially when they come from indigenous communities. Many human remains found in museums were collected during a time in colonial history when things were stolen from communities, or taken from people under duress. This known and troubling historical context deepens the need to treat these items properly today. return these remains to their originating communities known as “repatriation”. Looking through our records, we discovered that our shrunken heads had been donated anonymously, so we had no way of tracking down the donor. Without record of where our shrunken heads came from, we would have no way of knowing how to store them or return them in a manner that was culturally respectful. So with potential human remains on our hands, it became a priority to determine if our shrunken heads were real, so we could attempt to take an appropriate course of action. We reached out to several museums around the Lower Mainland, and Dr. Barbara Winter, Director of the Museum of Archaeology & Ethnology at Simon Fraser University, kindly offered to come down and take a look. It didn’t take her long to determine that the heads in our collection were fakes. In particular, she noticed that in our examples the noses and ears have very few features, and are very simplistic. She also noted that there is hair growing over the eyelids of the heads, which is also highly unlikely for most humans. We were very relieved with the confirmation that our shrunken heads were not real human remains. But while these heads are fakes, they are still quite creepy items to have in our collection! For more information, this article from the Pitt Rivers Museum in Oxford, England, has several shrunken heads in its collection, and discusses the ethics of keeping human remains.